LT Hotel Booking is Free Responsive WordPress theme that targets for hotel booking websites. This is modern and luxurious theme to offer hotel booking options, provide detailed information about its services and prices, then collect registrations and payments in one centralized online location. It is packed with features that hotel website might need such as a services section, special event, promotional prices, etc. 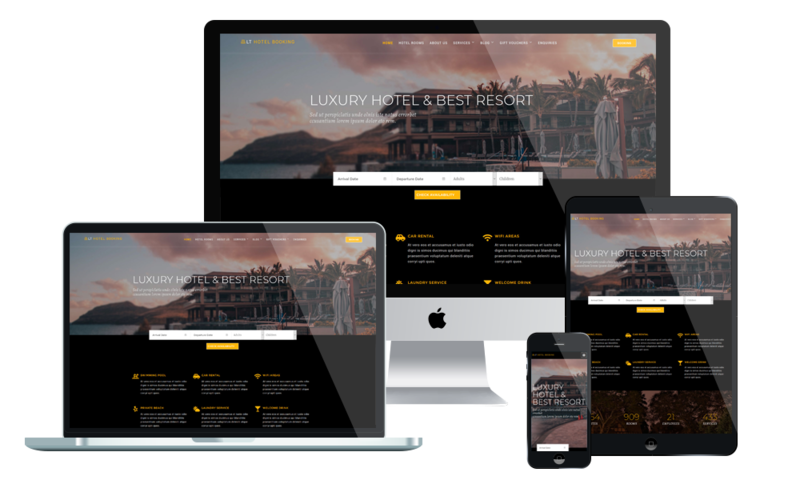 LT Hotel Booking supports fully responsive layouts to ensure your website looks great on any screen size of all mobile devices. In addition, it comes with lots of really useful built-in features such as strong shortcode, drag-drop layout content, Bootstrap CSS & Hybrid framework ready to help you easily customize the design and give your website that unique look. Amazing website can attract more visitors and increase your bookings. With LayersWP embed framework in our template, you can easy to create content by drag-drop, it is very simple without coding skills. By removing endless design options and features, Layers provides you with just enough choice to create a beautiful site while still maintaining the fundamentals of good design. With about us page, you can add one featured image besides the content. It will make your page look more amazing! In addition, this is a great way to show off your team and give them the chance to shine. About services page of this WordPress theme, you can list your products or services in details by using their unique page template. Besides, use the WordPress default gallery to showcase your products. Present all your hotel room on this page. So customers can find out more and consult on rooms that the hotel you are working on. We created this site to help you introduce to customers the events being about to take place in your hotel. The unique images will attract your clients to the events. Portfolio page showcases gallery about room VIP of your hotel for your customers. It allows you to categorize and tag your rooms in a way that does not overlap with the rest of your posts. We offer various creative designs in an eye-catching manner for portfolio page. You can set your blog posts to display on it. Write and share problems about new education on social medias like Facebook, Twitter, Google+… This is the best way to improve your customers relationship via blog. With this page, students will easily find the location of your school through address or map. And based on displayed information on website, they can find your schools phone number if they need to contact. Moreover, they easily send feedback through mail to your school.